doctrines and dogmas. Lutheranism is a WAY. 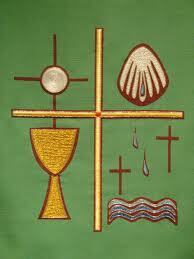 The central visual symbol in our worship is the cross. It is here, on the cross, that God meets us. God makes himself present: hidden in weakness, vulnerable, suffering, forsaken, and dying. In the abyss of despair, God comes. In our weakness, God encounters us. We do not find God. God finds us – in our darkness, our pain, our emptiness, our loneliness, our weakness. into God’s people. We are forgiven, set aside to be a minister. We are marked with the cross of Christ forever, and given the gift of the Holy Spirit. Christ in the world today. We affirm that the Holy Spirit gives us the gift of seeing – God in the infant Jesus, God in Jesus dying on the cross, God in all creation, God in history, God in bread, wine, and water. That same Holy Spirit bestows upon us the gift of hearing the Living Word. The Living Word is truth manifest in an event, a story, or an encounter through which God addresses us and calls for repentance, revolution, and a redirection of life. The Living Word is a living address that enters our ears calling for a radical change. of finding validation in our good works and in our status. Through Christ, God woos us and pleads with us, “I love you. I forgive you. I want you. Trust me. Obey me. Enter the joy of my kingdom.” When we hear this call, we hear the Living Word. Words are important, because they communicate the living event. Words witness to the Living Word acting in our history. Therefore, the Holy Spirit calls preachers, teachers, and witnesses to explain the living word in words. Since the time of Martin Luther in the 16th century, Lutherans have led a teaching movement within the Western Church. This teaching movement of the Lutherans is catholic, evangelical, and reforming. when the Holy Spirit will gather all Christians into a single body, a people who will be one, as Jesus and the Father are one. through faith. We joyfully proclaim that God comes in the flesh and says YES to all humanity. Gospel. When the Spirit directs us to reformation, we act in faith and trust. Central to our beliefs is that the church should be shaped by the Gospel. That means that we are called to die in order to live. But what does dying in order to live mean? It means meeting God where God chooses to find us – in our sorrow, our pain, our weakness. It means hearing God’s gracious word manifest in the death of Jesus on the cross. It means following Jesus in his death and resurrection. In this light, baptism becomes the overpowering event in our lives, the event which tells us who we are, whose we are, and how we are to live. promises of God and that God has said YES to us. Because of God’s YES, we are able to trust God, we are dedicated to human liberation, we walk in solidarity with those who are in pain, we are freed from sin and death but also freed for a life of service. We are justified (saved) by grace through faith!